Alexander J. Velicky has accepted an Associate Designer position at Bungie. 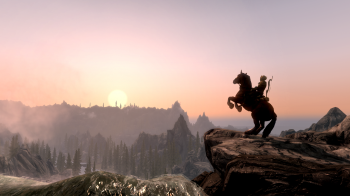 Remember Falskaar, the massive, DLC-quality mod for Skyrim from ambitious modder Alexander J. Velicky? If you'll recall, he poured over 2000 hours and a year of his life into the mod in order for it to serve as a portfolio of his work, in the hopes that someone would hire him as a level designer. Well, I'm glad to report that this story has a happy ending. Velicky has announced on the Bethesda forums that Bungie, Inc, of Halo fame, has offered him an Associate Designer position. "I'm very excited to announce that I've accepted an Associate Designer position at Bungie, Inc. I cannot express how excited I am for this. But this thread isn't about me. This is about me thanking you; The Community. Modding has been ~90% of my life for over four years now, and all throughout you were there to support me. I know this will sound weird since this is an open community composed largely of random anonymous people from 'The Internet', but you're kind of like my second family." Velicky used his forum post to express his gratitude to everyone who had supported him over the years, and answer a few questions over what this means for the future of Falskaar, and his other mod projects. "[It is] still entirely possible [that I will update Falskaar]. I still have some plans that may very well come to fruition. It all depends on after I settle in if I have the time and will to continue," he said. He added that while most of his modding projects will be put on hold for now, Fallout 4 may tempt him to get back into modding as "I got my serious design start in Fallout 3, so it's pretty likely that I won't be able to resist the draw of Fallout 4 and it's modding tools. Velicky leaves us with a "corny" life lesson: never be afraid to try. "I set my sights on a professional design job pretty early, I lowered my head, charged forward, and rarely looked back. Of course, I ensured what I was doing had a reasonable chance for success from time to time. But the most surprising of all, is who I've ended up with. I applied to many companies, and Bungie was in my, 'Huge company that will completely ignore me.' category. Well, they didn't and look what it got me."